Finally it is time to travel somewhere again. This time the destination is Macedonia and considering my travel companions, the trip is definitely going to be an interesting adventure. We are taking a train from Ljubljana (Slovenia) via Belgrade (Serbia) to Skopje (Macedonia) which is going to take no less then 19 hours. We are planning to spend a few days in the capital of The former Yugoslav Republic of Macedonia (or FYROM) as it used to be referred to due to a naming dispute with Greece. EDIT: I have been reminded by one of my readers that now the official name of the country is Republic of Macedonia. The main plan is to check out the city of Skopje, try some local food and drinks, and generally have a great time. We will have four days to explore the city and maybe also take a day trip somewhere else - I think Ohrid is one of the more obvious choices. Let us just wait and see. Unfortunately you will probably have to wait for the report until I return. I guess it is going to be a whole new year by then. It might have been snowing here in Slovenia for the last week or so, but I just have to finish my short series of posts about a trip to the Croatian island of Cres a couple of months ago. As I mentioned a few posts back, Lubenice is a village well worth a visit if you happen to find yourself on the island. 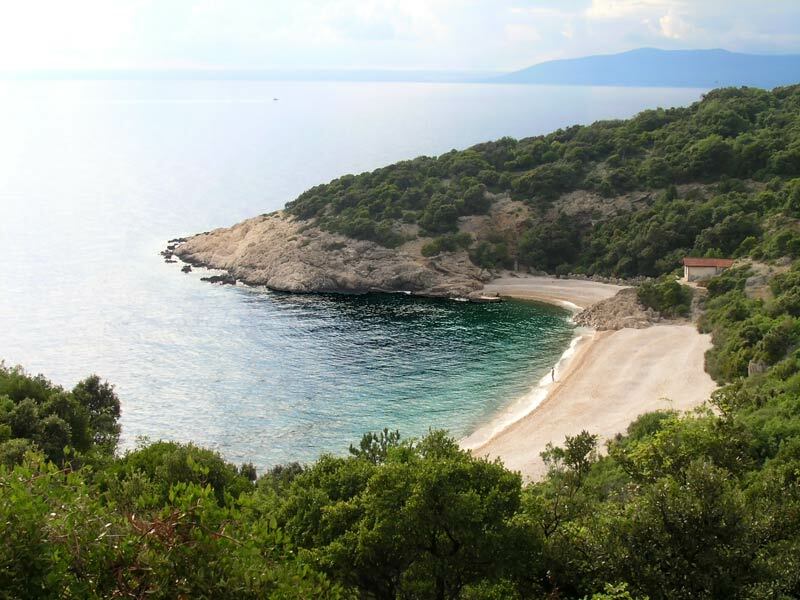 St. John (Sveti Ivan) beach bellow the village of Lubenice on the island of Cres is one of the loveliest hidden beaches in Croatia. It is not easily accessible from land - the descent from the village 378 meters above takes 45 minutes and the climb back even a bit more. The little bay can be approached only from two directions - one is a steep, narrow path we took and for the other you need a boat. 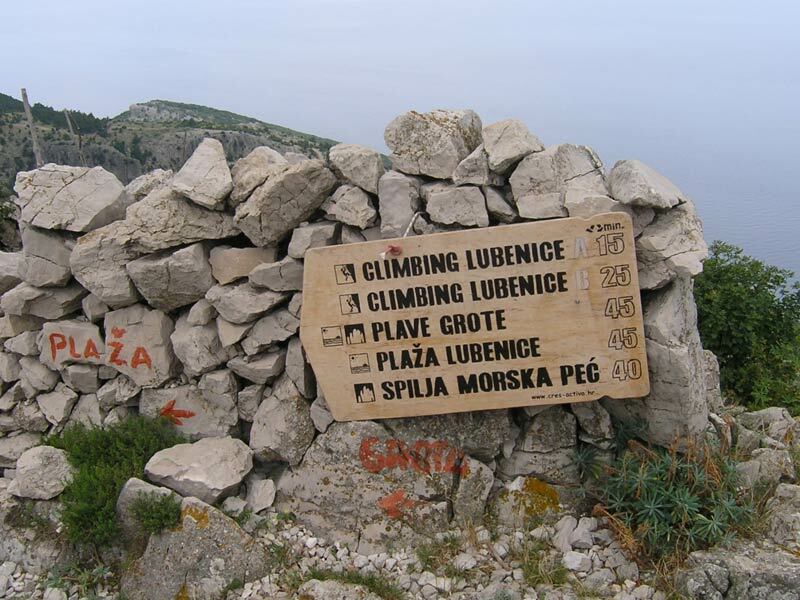 When we were still at the top, in the Lubenice village, we thought about not doing the whole thing at all. Dark clouds were starting to role in from the sea. We figured the worst thing that could happen would be some kind of a thunderstorm. Since we were going to get wet in the sea anyway, we decided to go down the path. 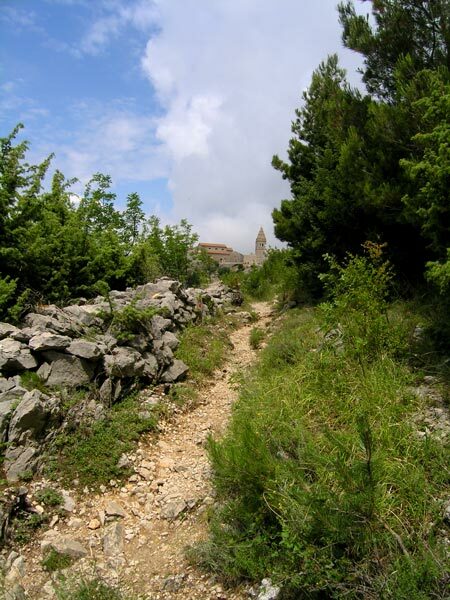 The path offered great views of the village above and also the idyllic beach below. We went by a sports climbing area which was also chosen by an eagle family as a nesting place. An eagle cry could be heard every now and then. When we were half way down, we saw a lightning which was followed by a loud thunder. Shortly afterwards it started raining heavily. The narrow path momentarily turned into a soil coloured stream. For a few moments we tried to take cover under some bushes, but all we got from doing that were dozens of scratches. As we learned a bit too late, the bush was full of thorns and its little leaves didn't give almost any protection from the rain. After a few minutes we decided it would be best to just keep going. When we got to the beach we were soaking wet. There we were greeted by a few other adventurers crowded under a small roof trying to stay dry. We joined them and waited for the storm to pass. After five minutes it was all over and sun was shining again. Time to dry wet clothes and to take a swim. It was great! The afternoon went by all too quickly and it was time to get going. On our way up we saw a person meditating alone on the picture-postcard beach during a magnificent sunset (if you look closely you can see him on the above photo). If that isn't an idyllic way to end the day I don't know what is! 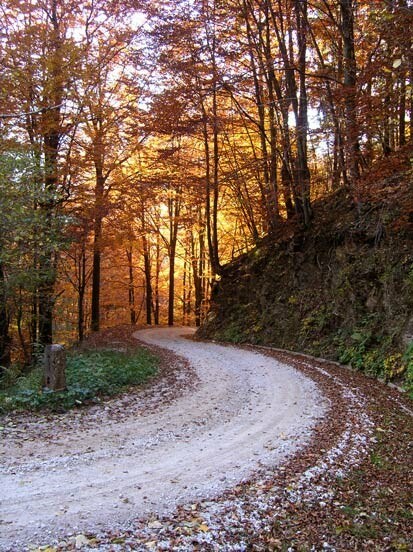 Since the winding path is pretty steep the climbing time depends heavily on ones physical condition. I guess since we needed almost the same amount of time for the climb as we did for the descent, we are not in such a bad shape after all. This trip was really lovely and I recommend it to anyone with taste similar to ours. However if you try to do this in top summer season, you might be disappointed with hordes of tourists rushing in on charter boats from nearby towns. Luckily we didn't see any. On our second day on Croatian island of Cres we decided to visit another picturesque little village. Ancient village of Lubenice. This time we were following a recommendation and were not sorry to do so. Lubenice literally translates into English as water melons. I don't know what is the connection between the name of this settlement and the fruit, but we definitely didn't see any watermelons while we were there. It is believed that this village has been continuously inhabited at least for the last 4.000 years. Yes, that is old - Bronze age old. I guess the natural setting of the village has always been a decisive factor. From a view of a strategic position, it has always been really well protected. The side facing Adriatic sea drops straight down towards the sea - 378 meters below. Enforced with a stone wall with only two entries during the Middle Ages I guess this was an unconquerable stronghold. Today it seems there are more churches in this villages then any other building types. When walking through the streets of Lubenice everything really feels old. 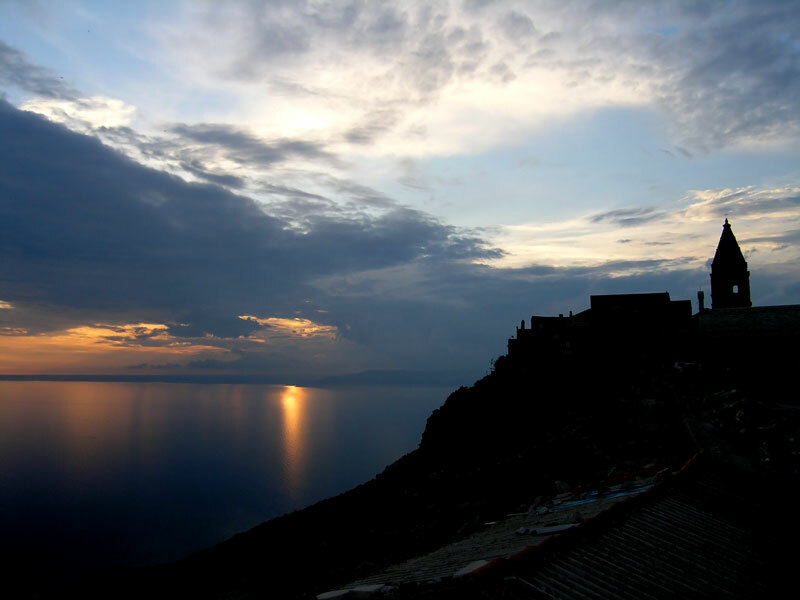 In clear weather it offers magnificent views of northern Adriatic. 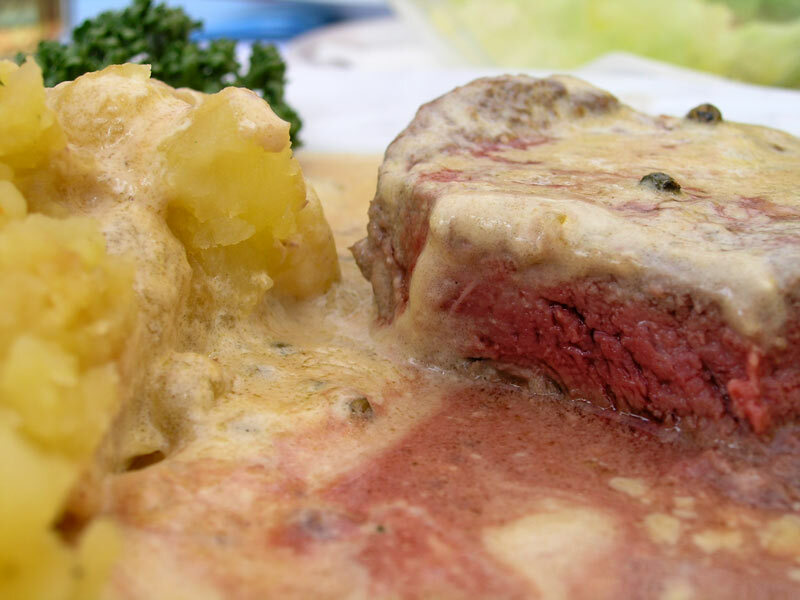 Local taverns are known for their excellent lamb dishes (jagnjetina ispod peke). I must say it really was delicious! The small tavern also has delicious local vine, cheeses and prosciutto on offer. Apart from enjoying a meal in a couple of very good taverns and visiting a small museum, there isn't much to do in the village itself. Have you heard of Google Wave yet? I guess most of you answered with a definite YES. For you two ignorant goat herdsmen, who haven't heard of it yet due to a busy goat herding season or something, it is time to get out of your cave and take a look at Wave's interesting features directly from members of the Google team. Even if it might seem this thing has nothing to do with blogging and even less with photography, that is not the case. Google Wave is a powerful communication platform which among other features also allows you to automatically publish your communications (interactions or "waves" as they are called) on your blog. You can also easily share your photos with your friends. These are just a couple of the features that Google Wave offers. If you want to know more, simply go to wave.google.com and check it out for yourself. Let me finally get to the point... Recently I have been invited to use Google Wave and awarded a few invitations myself. 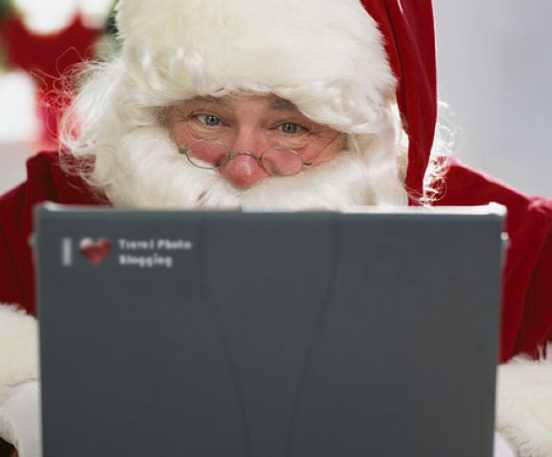 I have 5 invitations left and since Santa Claus spirit is in the air I decided to give them away to my readers. If you are interested simply leave your request with an email address in a comment to this post. After spending two days in central Istria, road led us to the island of Cres in Croatia. On our way to Brestova - our ferryboat link to Porozina, we passed by Plomin. 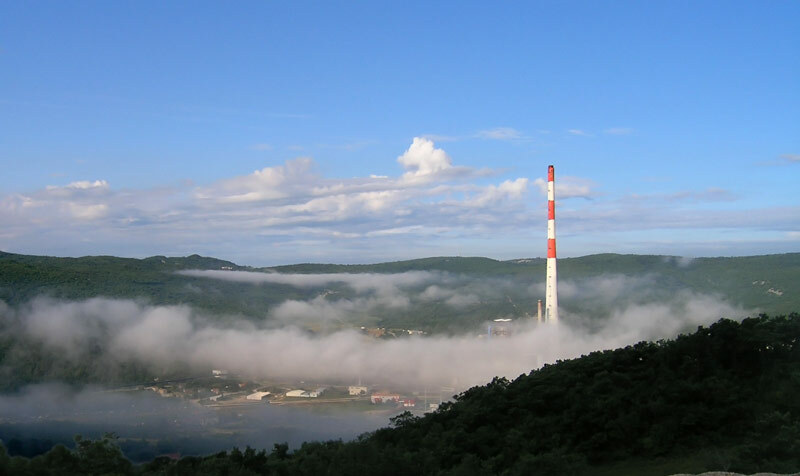 There was a tall thermal power plant chimney piercing low clouds in this narrow bay. Not an idyllic seaside destination by my standards, but it looks kind of nice in this photo anyway. After an uneventful, 30 minute ferry ride across to the island of Cres we spent an easy day planning our stay and settling in a small apartment in the town of Martinščica. We have been on this island many times before, but usually just to get to it's southern neighbor - island of Lošinj. 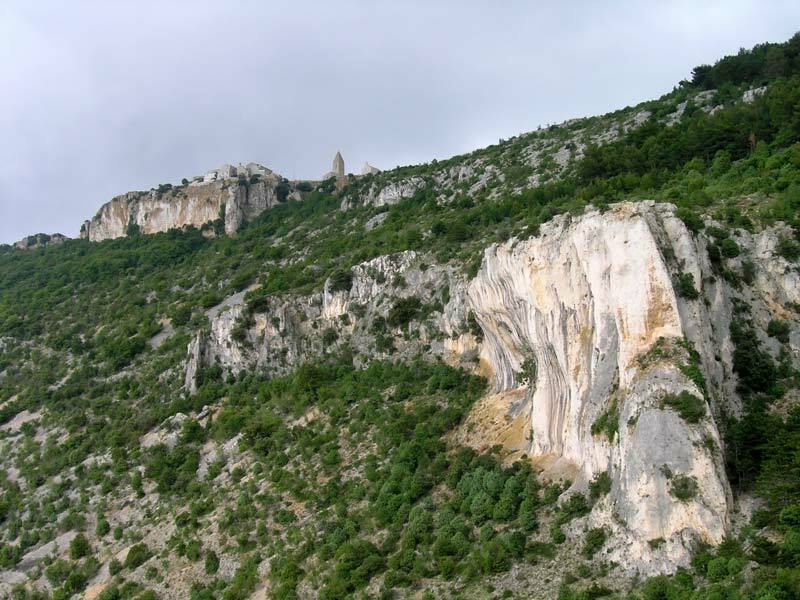 As we have discovered, Cres offers many interesting locations that are worth visiting. Since we were hungry, we decided to visit the fishing village of Valun and taste some fresh fish. We weren't disappointed with grilled cod and relaxed setting at the restaurant Toš Juna. 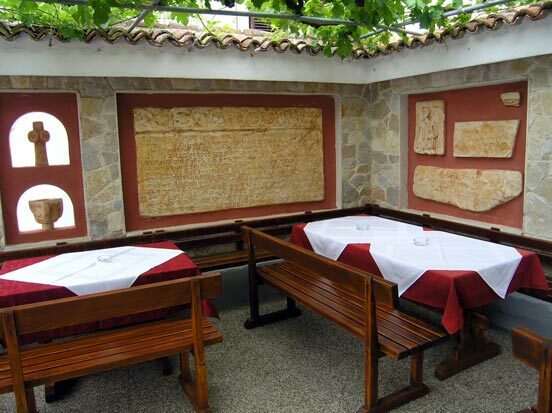 The restaurant walls are covered with replicas of ancient stone tablets (Valun tablet) the village is famous for. 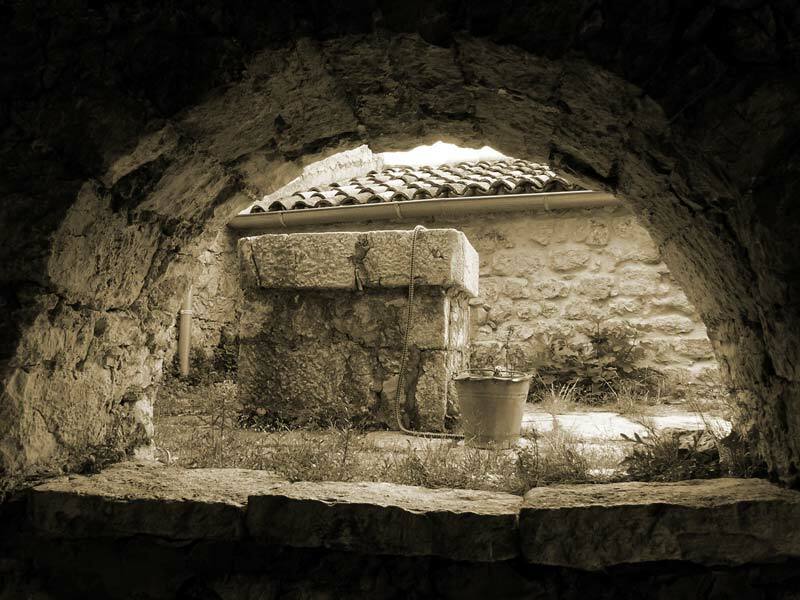 Tablets are believed to have served as an 11th century gravestone. 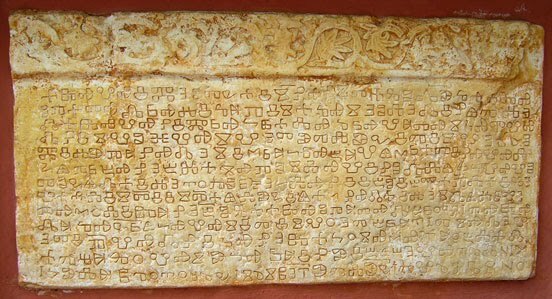 Written in bilingual (Old Croatian and Latin) and digraphic (Glagolitic and Latin) writing, the tablet truly is special. 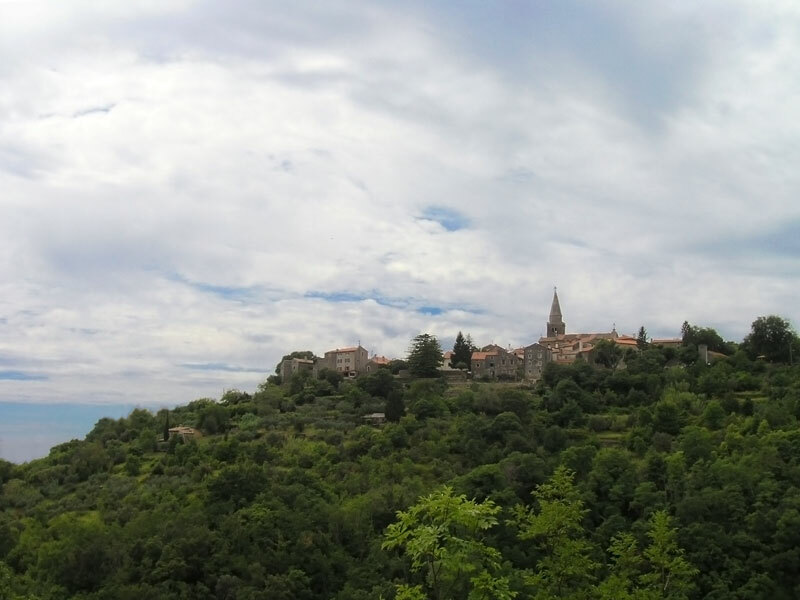 As I already mentioned a couple of posts earlier (click) I recently visited some charming hill towns of central Istria, Croatia. If I had to pick one of them, Groznjan (Grožnjan in Croatian) would be my favourite choice. Ancient feel of this town is really hard to ignore. It seems like time has stopped on that particular hill. When we were driving towards it, I wasn't sure we were on the right way at all. When we finally reached the town, parking lots were full of cars - only a few license plates were local. This seemed a bit strange, since from a distance it really looked like a small and peaceful medieval town. Today Groznjan is an artist colony, which is a result of the Croatian government’s effort to save hill towns from abandonment by offering cheap rents to artists. This seems like a good solution since the town was abandoned by its mainly Italian inhabitants after the Second World War. That happened when Istria was given from Italy to Yugoslavia. 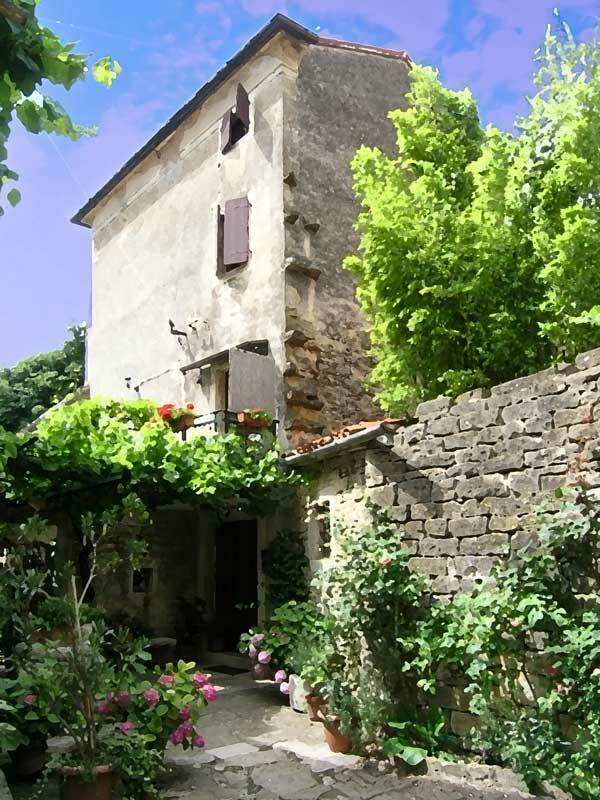 It is a small town but offers many beautiful vistas and picturesque narrow stone alleyways to wander. Every corner is filled with flower pots and various examples of local art. Definitely a right place to just wander around and soak in the positive vibe. I think the artistic touch on the above photo captures the atmosphere of this town perfectly. On one of the many town squares we found a promising tavern called Bastia and enjoyed a great meal topped with a glass of superb red wine. All that for a very reasonable price. Since M. is not too fond of truffles, we left them for our next visit. I definitely recommend you visit this place when in the neighborhood. Recently a friend of mine was driving towards Istria. She stopped at a Slovenian village of Socerga (Sočerga in Slovene), just next to the border with Croatia and sent me a couple of photos just to remind me of my own visit a few months ago. Next to the road going through the village of Socerga, there is a local tavern - Gostilna Sočerga. It looks quite unattractive and to a random visitor it may not seem worth a visit. Well it might look like that, but as you should know - looks can be deceiving. The tavern doesn't offer a great variety of dishes on the menu, but everything is really genuine. A better idea then looking at the menu is simply asking the waiter about the daily special offer. Usually at least one of the dishes is some kind of a truffle dish. I recommend you visit this place. If not for anything else, I am pretty sure this character of a waiter will make you laugh. You should not expect fancy service and also whatever you might order will not be delicately arranged, but it will probably be very tasteful and you definitely will not leave hungry. I could say portions are very generous at the least. Well let me get back to this friend of mine... When she was trying to decide about the daily offer, the waiter came around with a plate full of black truffles. "To help her with the decision", as he said. I guess I don't need to explain, why she decided for the "fuži s tartufi". That is some kind of local handmade pasta with creamy truffle sauce. I don't know about the actual price of the plate on the above photos, but I would guess the guy had to pay around 500 Euros for it. I am pretty sure he sold them for much more then that. If you want to read more about truffles and The place where you can get to know them up close and personal, you should also check out my previous post. For as long as I can remember, we have been vacationing in coastal towns of Croatian Istria. I guess that's mainly because Istria is a really close to Slovenia. Now this peninsula is a part of Croatia, but when I was still a boy, Slovenia and Croatia were both parts of Yugoslavia. I drove through the Istrian peninsula many times but I can't say I have spent much time exploring the central part of it. Lately it is marketed as “the new Tuscany” and I must say there definitely is a resemblance. Unfortunately until recently I was always speeding past those charming old hill towns, just to get to a seaside destination of choice as quickly as possible. A couple of weeks ago I had a different plan. Together with M. we decided to taste the land of truffles. It was a two day trip and we are not sorry we did it. We saw some great stuff and enjoyed delicious local food. 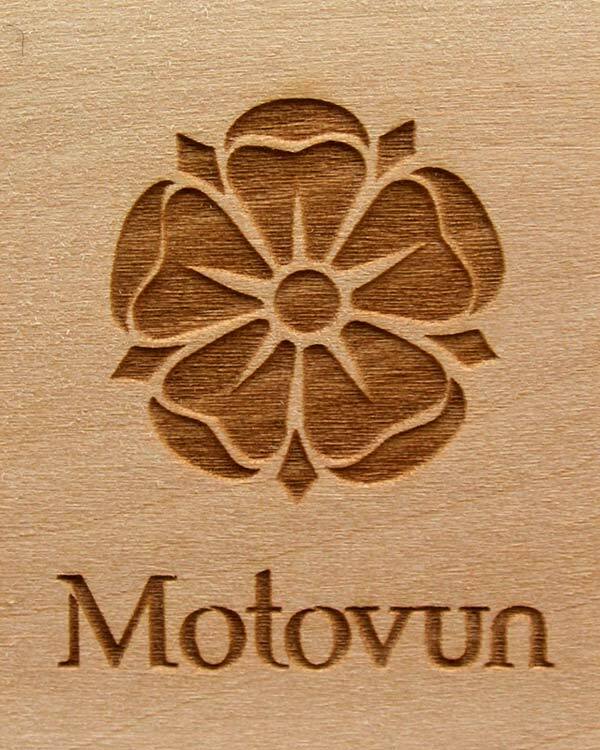 We started with a visit of Motovun - a town where once a year a film festival takes place. The town sits on a highest hill in the neighbourhood and is surrounded with lots of smaller hills. I guess that is the strategic advantage its founders many centuries ago were looking for. That's also the reason we spotted it from far away. We parked our car on the slope of the hill and walked into town (only residents are allowed to drive into town). Charming, narrow streets are literally impregnated with the smell of truffles. 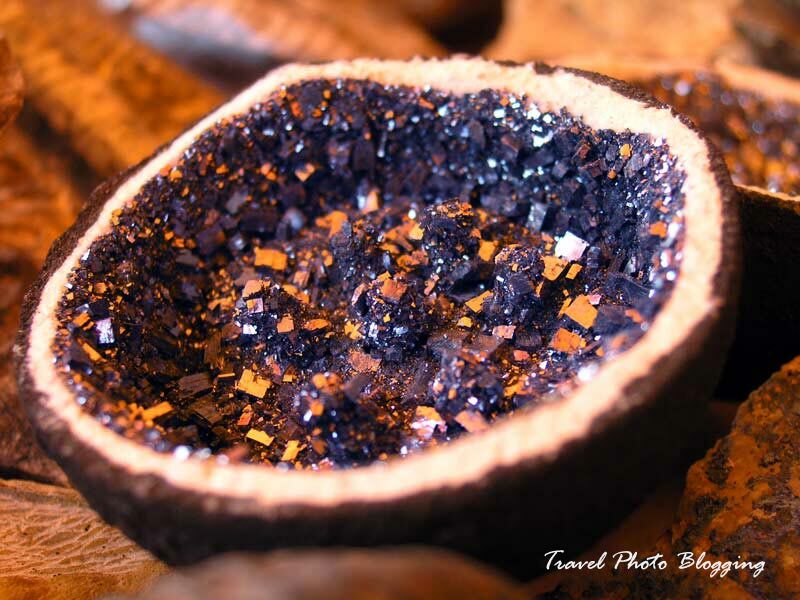 If you don't know that specific (almost unique) truffle smell, it is really hard to explain it. The closest description I have heard so far is: "a combination of musk, nuts, and ozone". If you think you have a better description, please share it with me. We took a chance to compare black truffles to famous white ones. Almost every shop offers free samples of truffle paste and wine. I couldn't say the two kinds of truffle paste tasted all that different. However I am not an expert on this, so I might have overlooked an important detail or two. 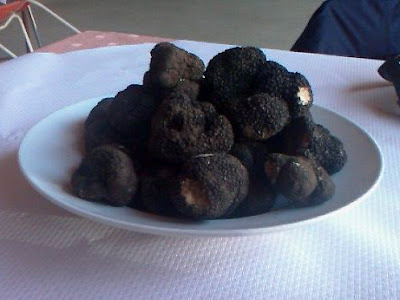 For the truffle ignorant people out there, let me just point to the financial side of this delicacy. 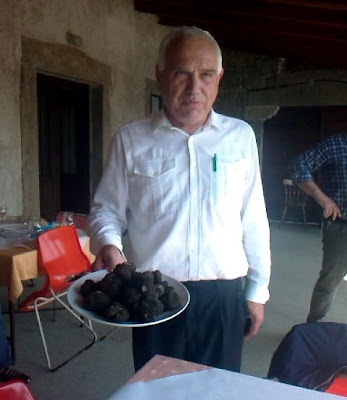 A kilogram of black truffles costs a couple of hundred Euros (usually around 400 EUR), which is nothing compared to it's white relative. Since it is considered to be superior in smell and taste to the black truffle, a kilogram of white truffles can cost a couple of thousands of Euros (usually around 2.000 EUR). The financial part aside, dishes seasoned with truffles are definitely not one of those things everyone would like the first time. Well... we found out M. was one of those people. Let's just say she didn't like the smell of Motovun. At all. That was one of the reasons we decided to move on without enjoying a proper meal. We headed for the town of Groznjan (or Grožnjan) and after that we also visited supposedly the smallest town on the planet - Hum (more about that in the next post). The nearby town of Livade was left for our next visit. 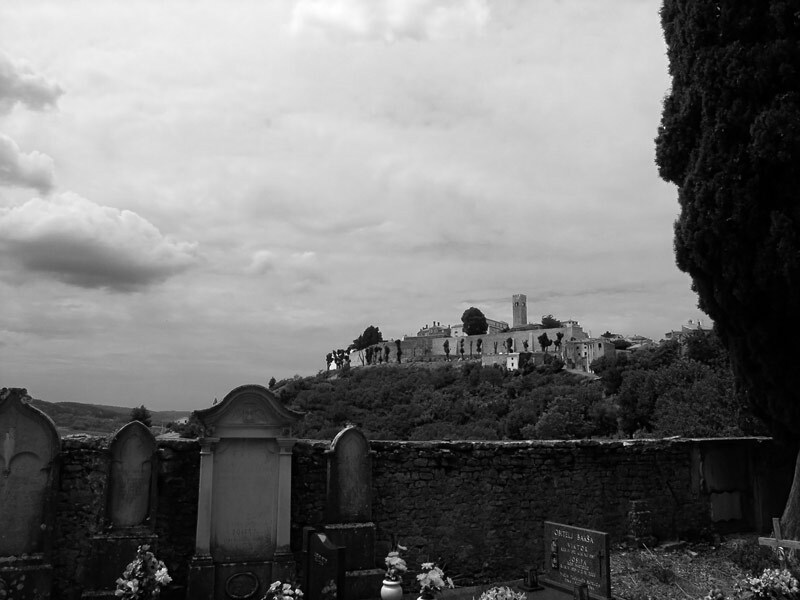 Before we left it, we also stopped at the town cemetery, which offers a great view of the town. 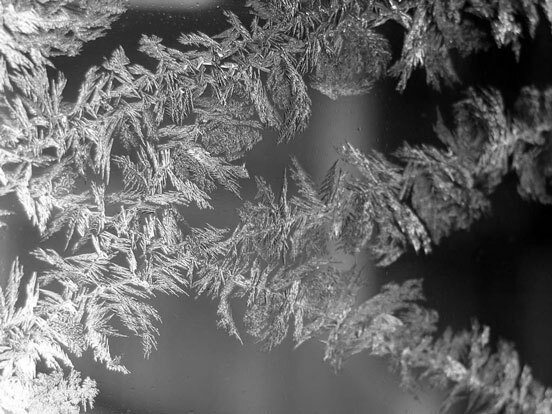 If you have a chance to visit these parts, this time of year might be the best time to do it. 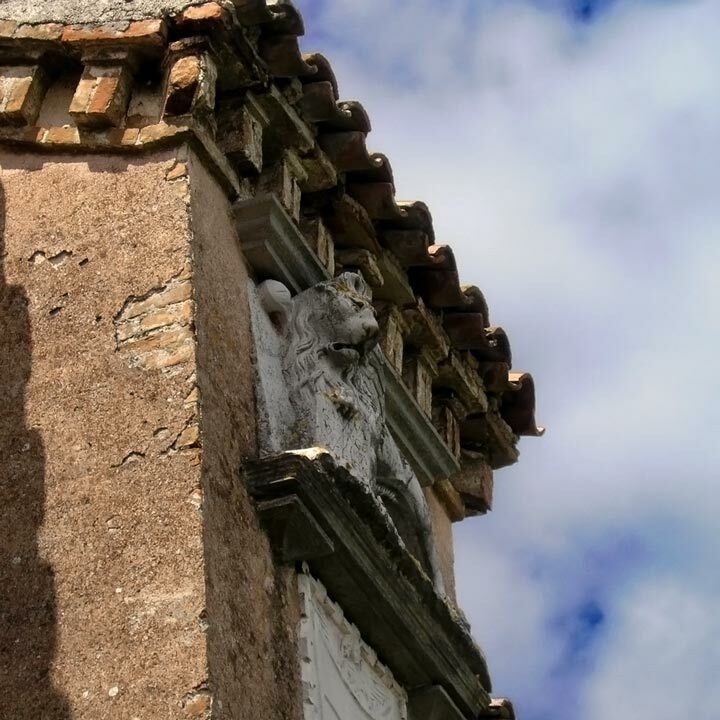 There are many things going on at the moment in central Istria. For more information check out this official list of truffle events. Hiking is a very popular activity in Slovenia. Since mountains and also hills of all kinds can be found in every corner of the country, that is not very odd at all. If you like hiking, you just must visit Slovenia. It simply offers countless hiking opportunities for all kinds of hikers. 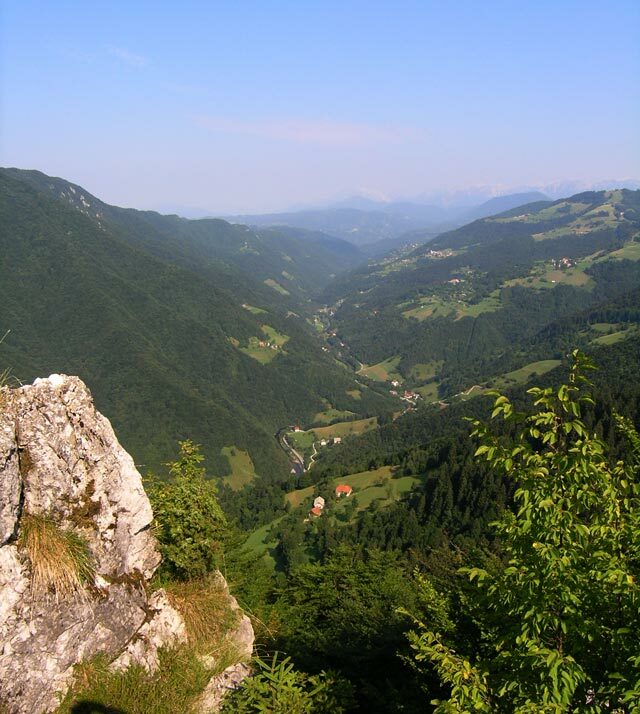 There is even a Slovenian hiking web page, with hiking tips and reports from many trips around Slovenia. As a Slovenian, I also do it once in a while. I really don't have to go far to get in touch with nature. 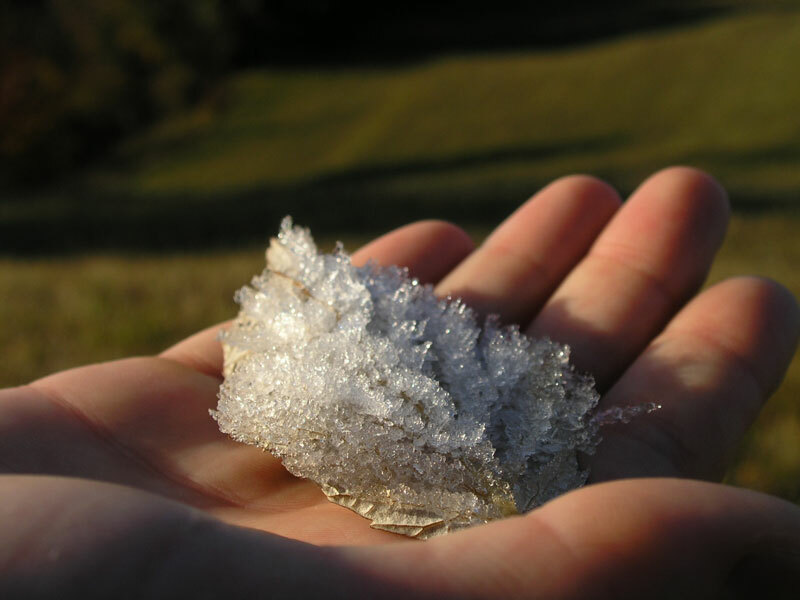 That's one of good things about Slovenia - where ever you are, nature is never far away. Even when standing in the center of Slovenia's capital (Ljubljana), one doesn't need to go far to get in touch with nature. With a bit of luck, after a fifteen minute drive one could find himself next to a herd of cattle. Since I live 60 kilometers west from the capital and a forest literally starts where our backyard ends, I am used to being close to nature. A couple of weeks ago I decided to go hiking with a few friends. Nothing special, just a morning hike up a nearby hill (next to the small village of Ledine). We had a great time nevertheless. The whole time we were accompanied by a young beagle dog. A very curious and full of energy representative of the breed. It took us almost 2 hours to get to the top, where we were rewarded with great views of the Idrijca river valley. We took a different - a bit shorter path back down. Since we liked Essaouira so much, departing hour definitely came way too early. Before we joined our Moroccan travel circle where it begun (that's in Casablanca), we still had some time left to soak in the relaxed atmosphere of Essaouira. 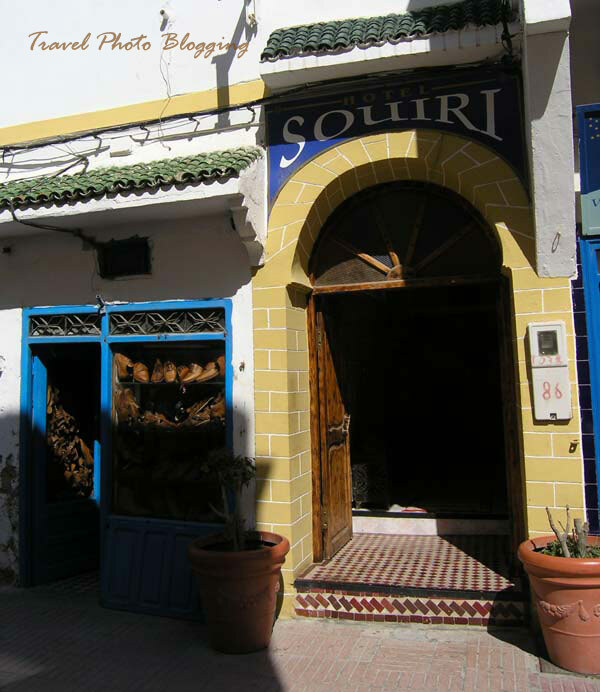 No matter what sort of goods you might be looking for, in Morocco it is quite possible to find it all in one shop. On some occasions you might try on a new pair of shoes and in the meanwhile buy meat for dinner. You could get some blood on your new shoes in the process, but that doesn't really matter. You're in Morocco, remember? During our last morning in Essaouira we walked by the countless cannons lined up on city walls once again and treated ourselves with another delicious seafood meal. 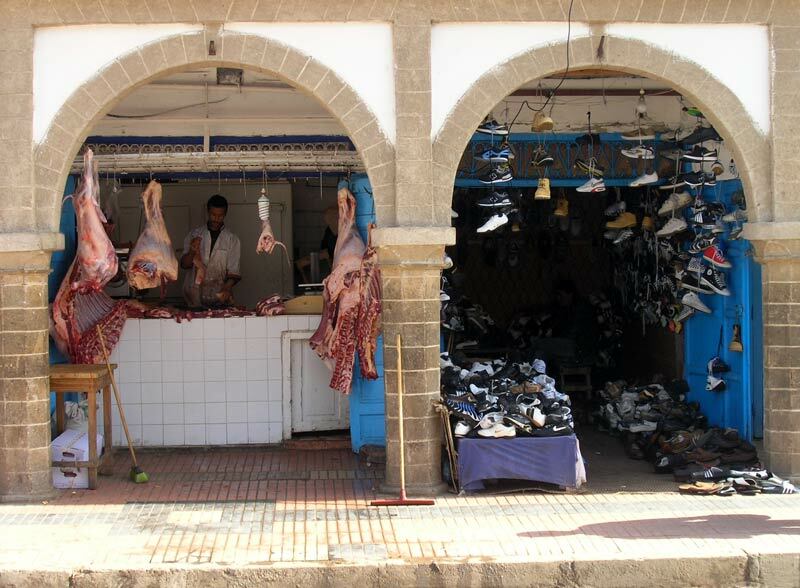 The last week in Morocco went by, strongly tasting of fish. We had a seafood meal at least once a day. Most of the people I know would have had enough of it much sooner, but we just couldn't resist it. It was always as fresh as it could be and usually also very delicious. At some occasions some of the fish we chose from, were still moving. When we finally walked to the bus station, we noticed there was something wrong with one of the tires on our bus. Since we were a bit early, we figured out they would fix it in time. Scheduled departure time got closer with every minute, but a few of the employees from the bus station just couldn't decide how to handle the situation. After some half an hour of walking around the bus and discussing the situation, it seemed something was happening at last. To my amusement I realized they all went away just to get some coffee. When they finally got back they tried a few new things. By then most of the passengers were quite amused with the show. Obviously nobody was in a real hurry. At last the bus driver decided that going to a nearby gas station would be the right thing to do. He was back in 15 minutes and we were ready to go. I wasn't so sure at the time, but fortunately the tire lasted all the way to Casablanca. In Casablanca we had lots of time to spend the remaining Dirhams. It wasn't a hard task, since we didn't have all that many left. We met some more interesting people while hanging around the city center. The most interesting were father and son from Saudi Arabia. They were in Casablanca on a business trip and were arranging some details regarding sports clothes manufacturing. They were setting up a production of various copied trademark clothes. For me the most amusing dirty detail was sowing labels "Made in China" onto the products. Obviously, various products are not being copied only in the Far East. There are others (Moroccans in this case), who copy the Chinese. Actually when you think of it, Nike, Adidas and such products are all made in China. And to make a perfect copy, the label also has to look as genuine as possible. After an illuminating chat with the two Saudis, it was time to catch a train to the airport. Moroccan trains are quite good - they could easily be compared to European standards. Unfortunately due to Atlas mountain range, stretching over a considerable part of Morocco and rising over 4.000 meters above sea level, the railroad network does not cover a very large part of the country. That is why we did most of our traveling by bus. Later that same night we boarded our MyAir flight to Venice, Italy. Everything went smooth and in the morning we were met by M's sister, who took us home to Slovenia. We really enjoyed this three week Moroccan adventure of ours, but it is nice to be home again. "The city of Mogador" - it sounds like a fairytale place from Tolkien's Lord of the rings, doesn't it? 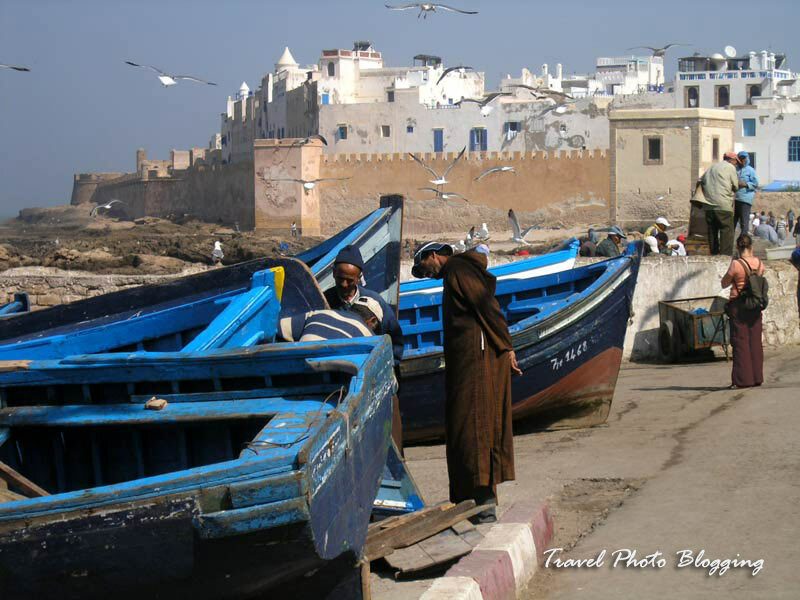 Although it really looks like a city straight from a fantasy book, Essaouira is an easily reachable destination. 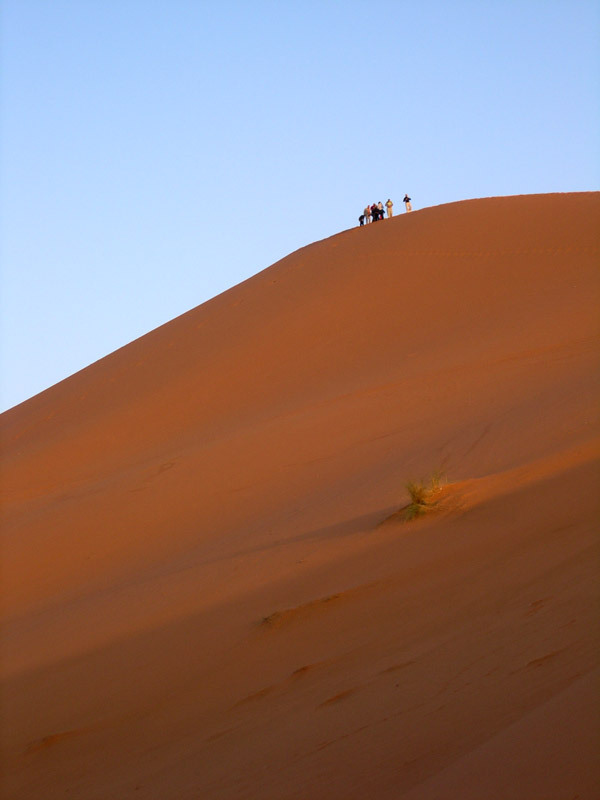 It is one of top 5 Moroccan destinations and a go-to place for wind and kite surfers. 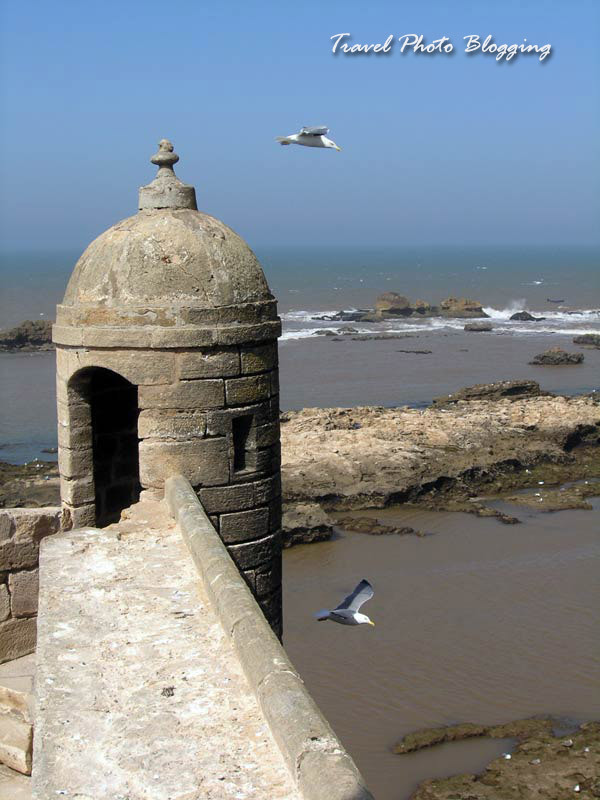 Mogador is an old name given by the Portuguese who occupied the city in the 16th century. Some remains of their influence are still visible today. Even if one could not feel the winds that are blowing literary all the time (hence the name "City of wind"), it would be easy to figure it out from countless seagulls effortlessly gliding over the city. Every time I passed by the fishing port area, I was just waiting to get crapped on. Surprisingly even after countless photo sessions in the danger zone, I escaped unharmed. 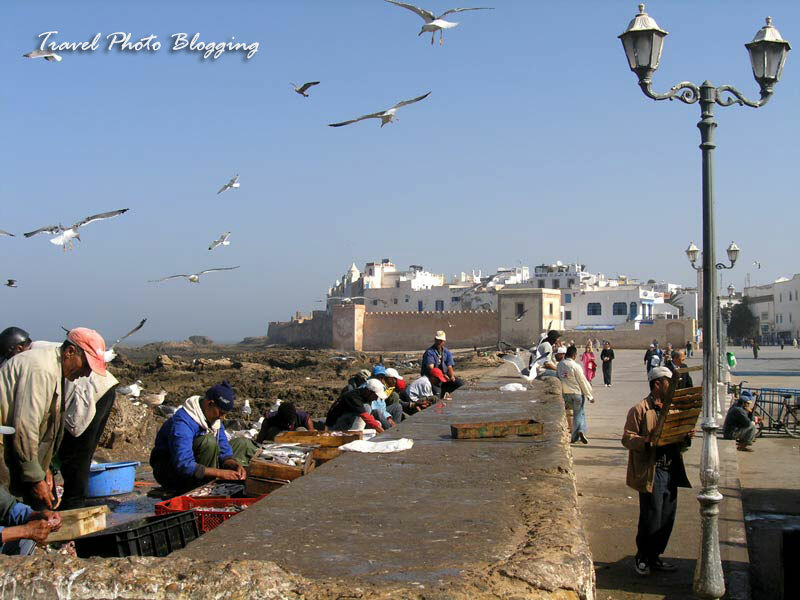 Essaouira is easily one of the top five most photogenic cities in Morocco. Despite being quite small, it has loads of interesting streets and corners. Skala de la Kasbah - a section of city's 18th-century walls, surrounding UNESCO World Heritage medina, is just one such example. Musée Sidi Mohammed ben Abdallah, the beach, city souks and port are also places worth visiting. 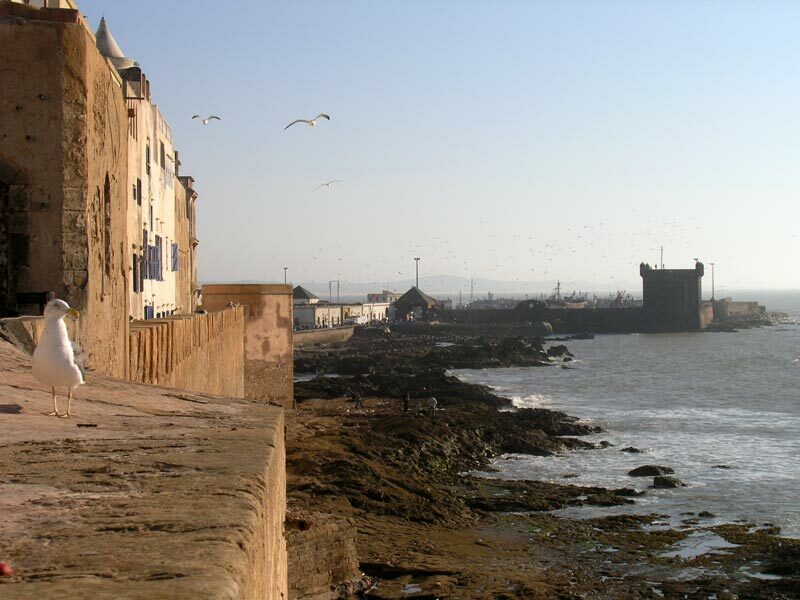 Among everything else, Essaouira is also a city of music. Once a year Essaouira gnaoua music festival is held here. It usually takes place in June and attracts people from all over the world. 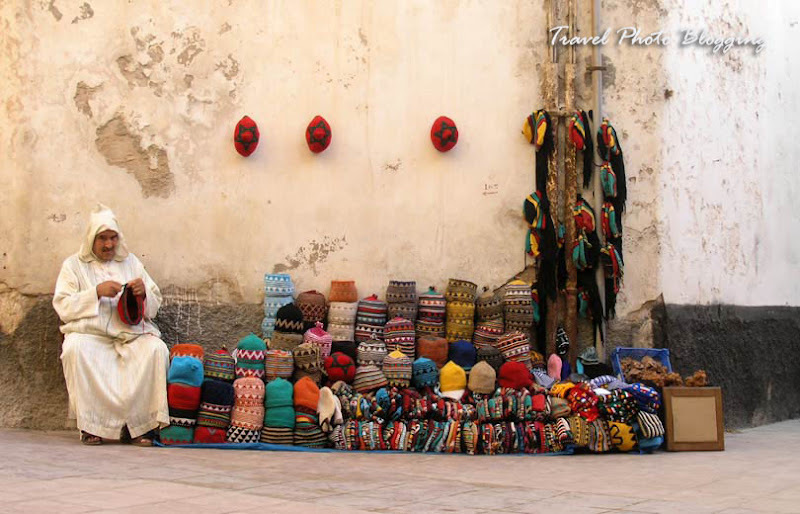 There are also many gnaoua (also spelled gnawa) bands performing in Essaouira every day. Locals say gnaoua music is a genuine African mix of music influences and a link to the past. Although we didn't catch the festival, we were lucky enough to participate in a relaxed music session with a local band. A local guy invited us to participate in an evening session of their gnaoua band. 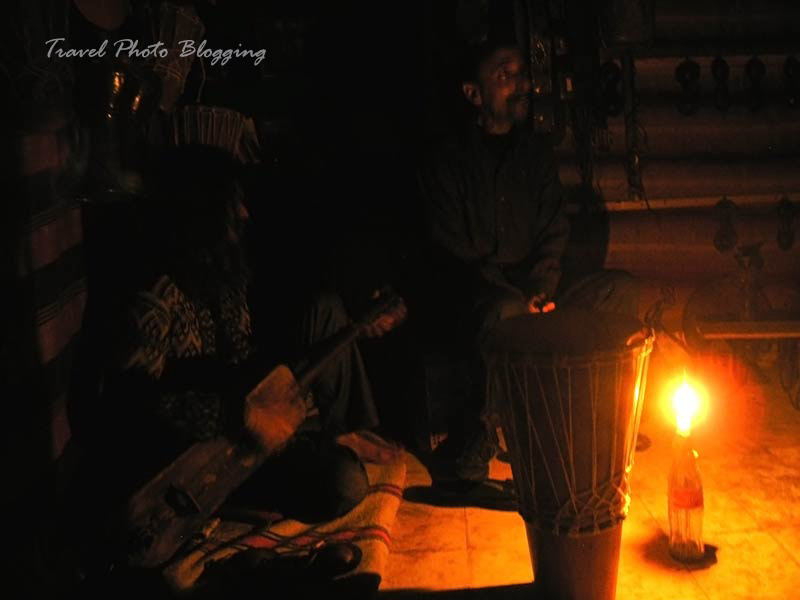 It was quite interesting to see them in action, playing traditional Moroccan instruments. 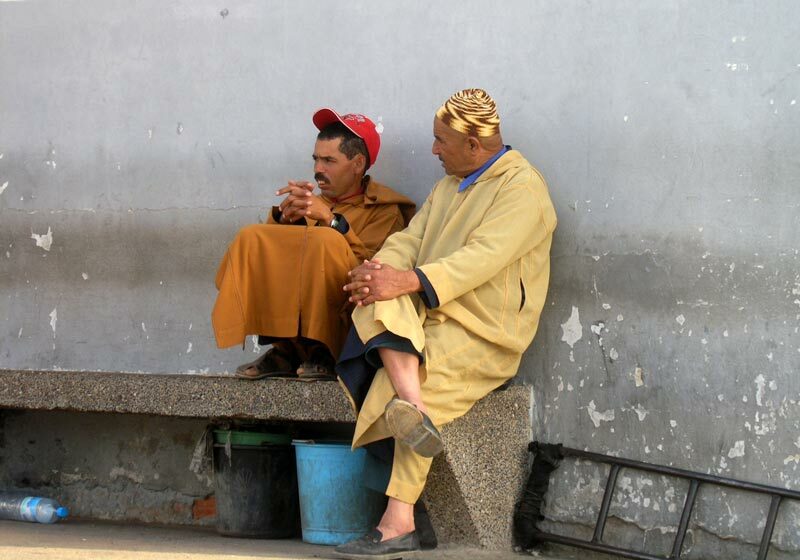 Locals were quite amused when I asked a member of the band if there are many music schools in Morocco. He just couldn't understand the concept of learning music in school. He said music is something you learn as you go - pick up an instrument and try to play. You simply feel it or you don't. The atmosphere was really relaxed, with a strong scent of green in the air. Something tells me that smoking hashish is an important part of Moroccan music. That evening it felt almost like the fifth member of the band. The bus from Agadir to Essaouira was scheduled for 8 AM, so we had to get up pretty early. We packed our backpacks, payed the bill for our stay in the very nice Hotel Tiznine and left for the station. We didn't know how long it would take us to find a petit taxi, so we left a little early. As soon as we got to the main road a little Fiat Uno pulled over. After a short negotiation process, the driver agreed to take us to the station for 12 Dirhams, which was quite OK.
We got to the station about a half an hour too early. Since we had bought our tickets in advance (at the CTM headquarters), we didn't need to get involved in tiresome haggling over the ticket price. Those guys looked really disappointed when we told them we already had our bus tickets. Instead we took a seat at a modest (but quite expensive) café and ordered a mint tea. The moment we ordered our drinks I realized we didn't ask about the price. Obviously that can happen even after more then two weeks in Morocco. I am pretty sure they charged us a double or even triple price for those two glasses of mint tea. I guess every lesson has a price. We took this lesson more then once, during our stay in Morocco. Since it was usually just drinks, it didn't matter all that much. We were already getting tired of waiting when our bus finally arrived. Before all the passengers got off, the new ones got on and all the bags were loaded in, the departure was already delayed for 45 minutes. In the end we finally got on our way. Including a single half way stop, the ride was nothing special. 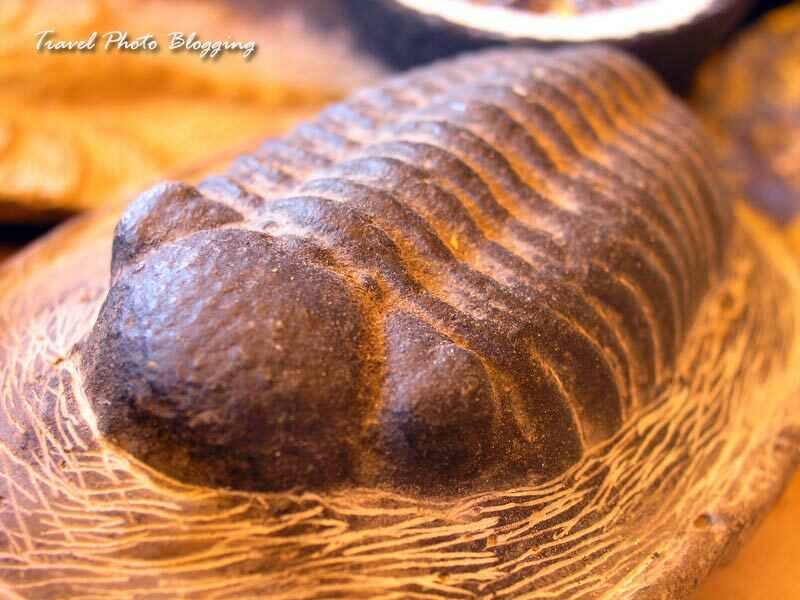 Again there were many fossils and minerals on offer. Of course freshly prepared couscous was also available. The stop didn't take long, so soon enough we reached our destination. 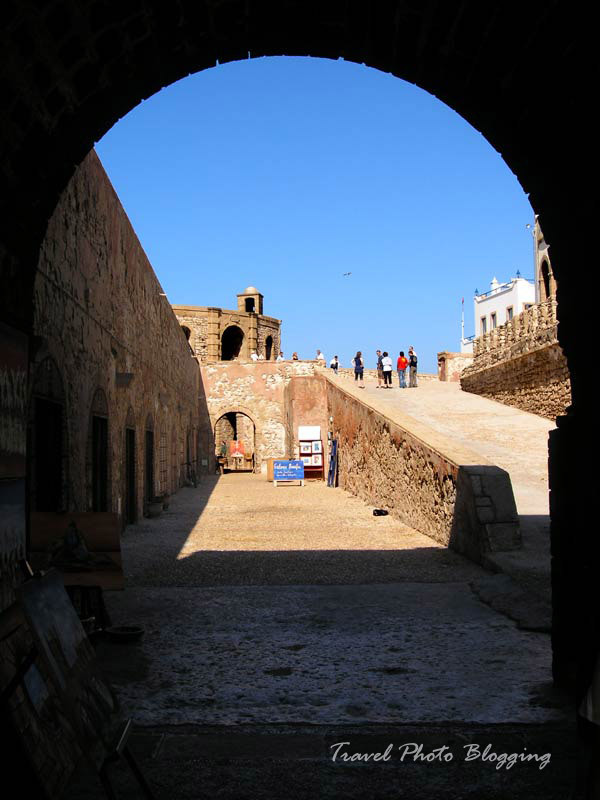 First we had to find a way from the bus station to the old city center within the city walls of Essaouira. It was quite a task to get rid of all the annoying locals, offering a place to stay. We had a place picked out from the Lonely Planet Guidebook. I think we chose the cheapest one listed in the budget accommodation section - the Hotel Souiri. When we finally located it, we were unpleasantly surprised to learn that the price jumped for 100 MAD for a double room without a bathroom. Since the place looked really clean, we agreed to take the only free room they had. The hot sun has drained M. of even that little energy she had left. That meant she decided to test our new bed for a while. I went out to wander the streets alone for a while. After an hour of much needed rest she joined me and we went exploring the walled city together. 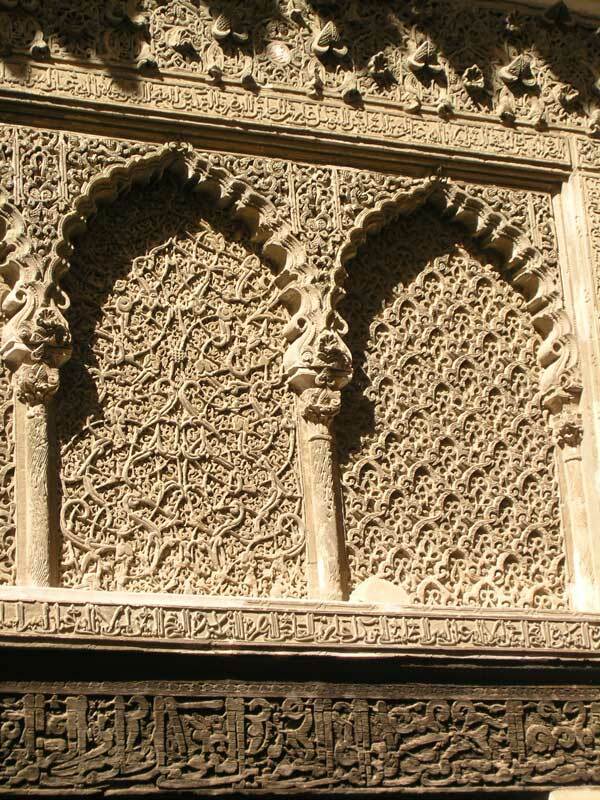 Pretty soon we learned that this city is also quite touristy, but with lots of character when compared to Agadir. It was really fun to wander its narrow streets. 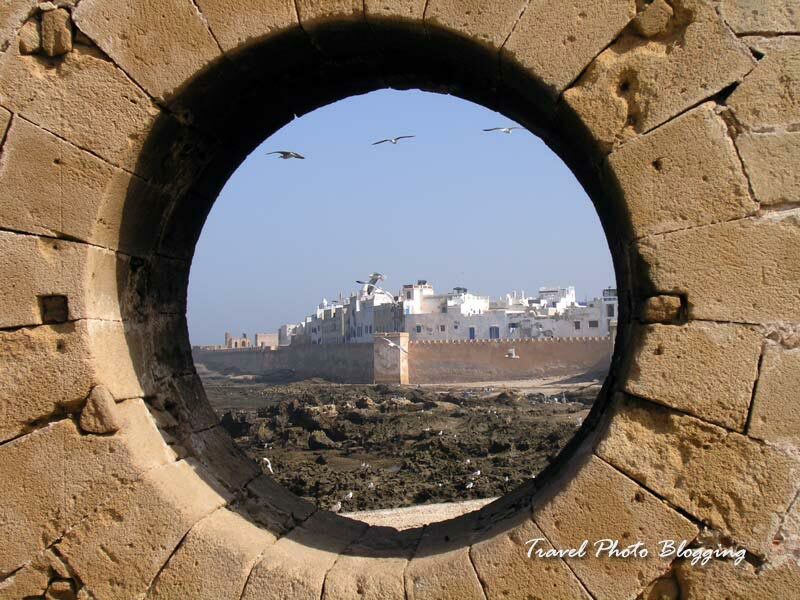 If you are looking for a photogenic location in Morocco, you definitely can't go wrong with Essaouira. 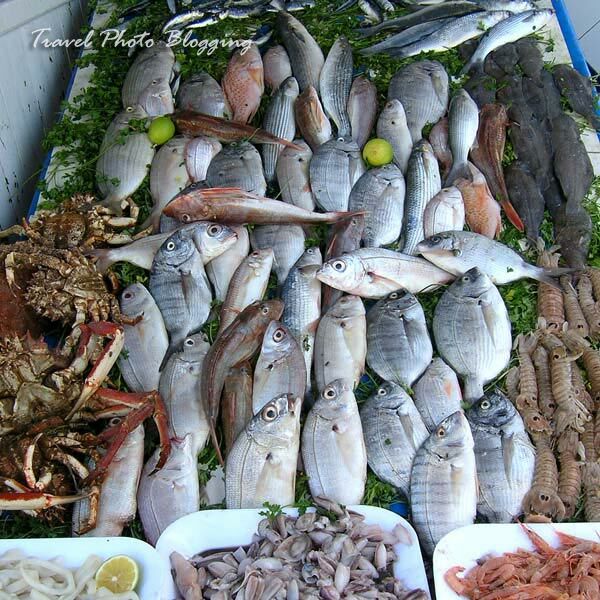 Next to the port we found stalls with fresh fish, which are ready to be served in a matter of minutes. Fish were really fresh - some even still alive. We treated ourselves with two huge fish (a red snapper and a sea bass). Together they weighed just over a kilo. It was a real feast (not very cheap, but definitely worth the money). Afterwards we were quite exhausted and decided to call it a day. We agreed to check out the port and the city walls on the next day. When we got to the hotel, a quick shower followed and then it was time to get some sleep. I think I fell asleep the second I closed my eyes. 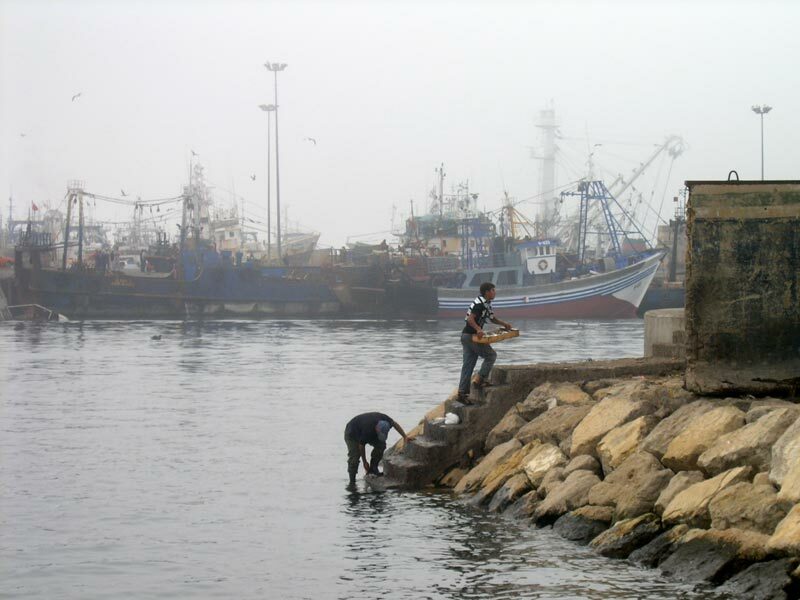 Before Agadir was turned into a seaside destination for Moroccan rich&famous and a popular resort for many western tourists, it was a simple fishing village. Minutes before midnight on February 29, 1960, everything changed for the city of Agadir. A major earthquake destroyed the city to the ground, killing 15.000 people. The remains of the old kasbah can still be seen on a hill overlooking the new city today. Moroccan king decided to rebuild the city and a year after the disaster, rebuilding actually began. An old fishing village was slowly transformed into a high class seaside destination with fancy hotels and hip bars. 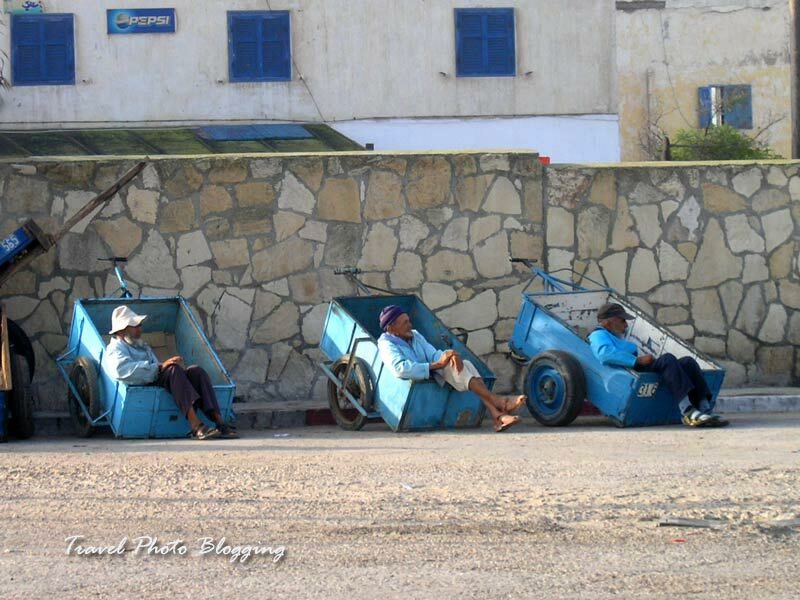 Let me just point out, that we saw more trash cans in Agadir than in all other Moroccan cities combined. It really is clean - even by European standards. Despite all that, a stroll through the city docks reveals a mighty fishing fleet. 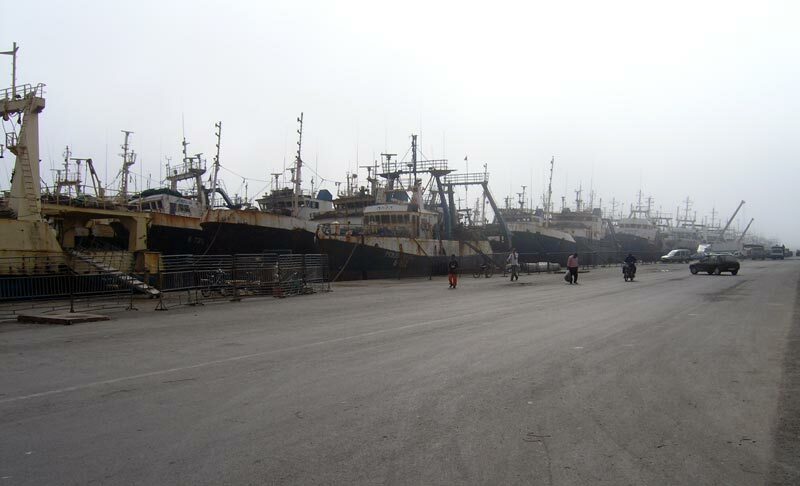 When we reached the sea, there were countless fishing boats lined up left and right from where we were standing. We couldn't see to either end of the long row. Rusty ships were disappearing into the mist both left and right from us. With fishing fleets of such size, it is a miracle there are still at least some fish in the ocean today. Another interesting thing was the shipyard. 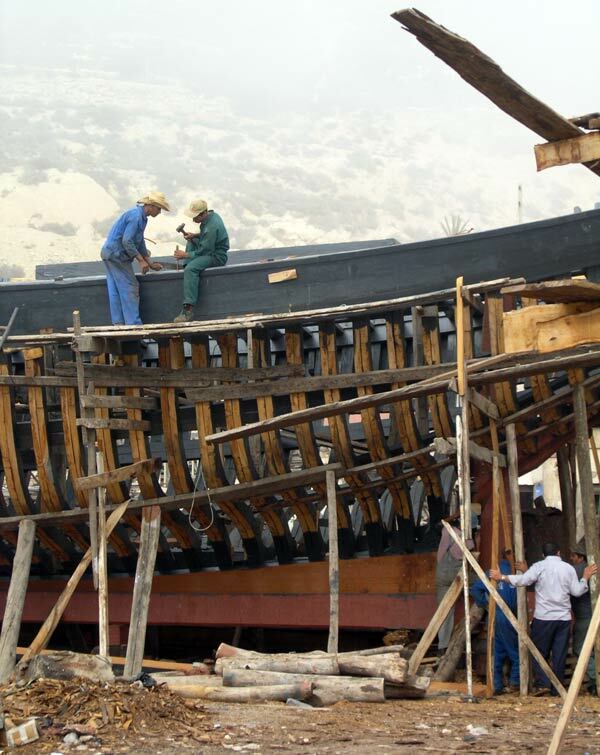 We curiously observed a group of locals working on a wooden hull of a ship. Not a common sight these days. Nearby there was an improvised stall, where different sea creatures were displayed. 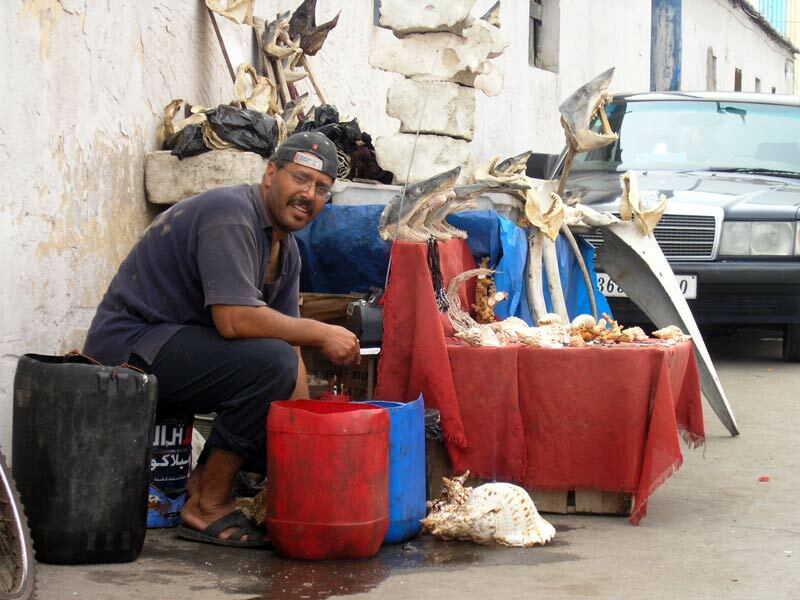 One could buy a whale's rib bone, a giant sea shell, a razor-sharp shark tooth, a whole shark jaw or even a scary looking shark head. We weren't really thinking of buying anything, but we talked to the guy, scrubbing a giant sea shell, for some time just the same. On our way back to the city center we were both laughing at the idea of us walking through airport customs with a meter long whale rib-bone in one arm and a huge shark head in the other, trying to convince a customs officer that it was all just our usual personal carry-on luggage. We couldn't resist a mint tea on the way back to the hotel. There we made plans for the next day. We decided that in the morning it was time to move on. Even though Agadir is not a typical Moroccan city, we enjoyed our stay. We took the opportunity to just relax and power up for the few days of travel we got left. We liked our room at Hotel Tiznine so much that we decided to take it easy for a couple of days and just relax. Agadir would not be my first choice, but M. really needed some time to get rid of the cold she caught in the desert and to just relax for a few days. Her cough really didn't sound encouraging at all. As a consequence of all this, our first day in Agadir started quite late. We slept like dead until 10 in the morning and even then we didn't get up straight away. When we finally got out of the hotel it was time to find a patisserie. We found a promising one on our way to the beach. 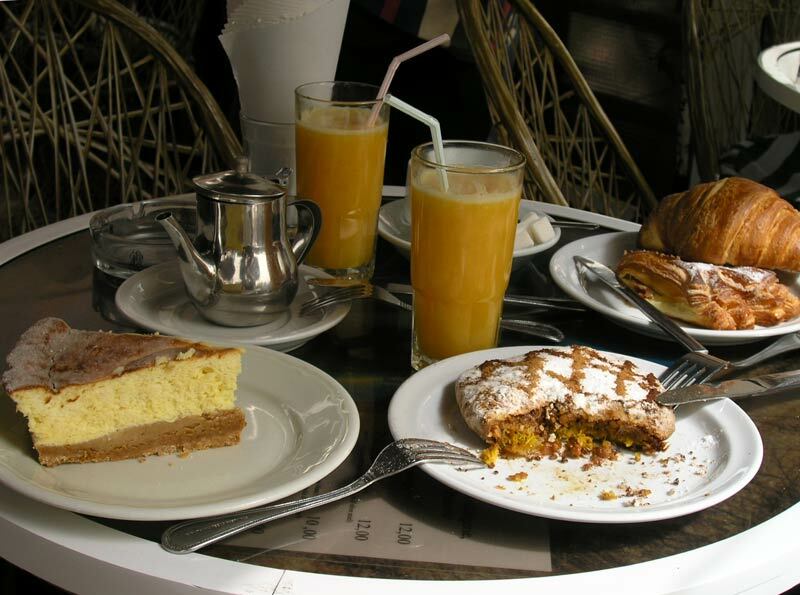 That once again reminded us why it would be really stupid to break our habit of such breakfasts while in Morocco. We tried some new local sweet delights and were not sorry we did it. Everything we tried was really delicious. 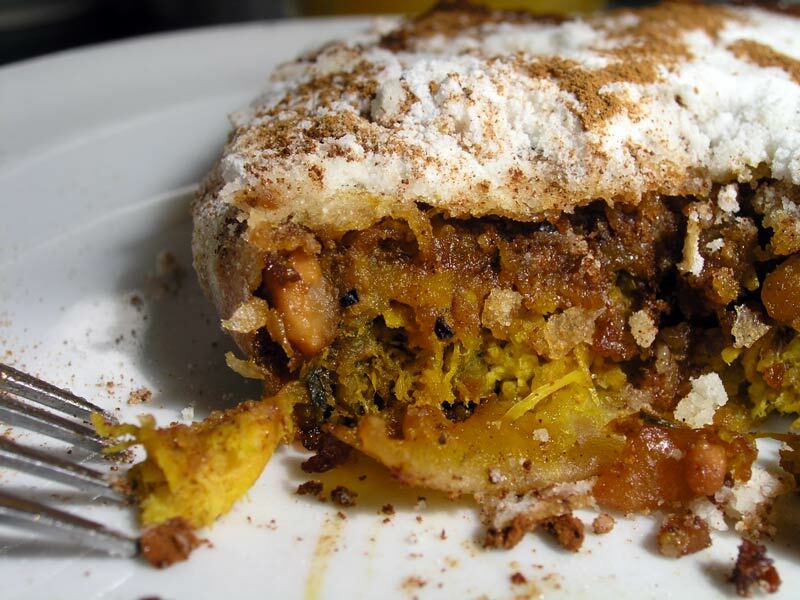 Among other things I also tried Pastilla - a typical Moroccan pie filled with chicken, honey, nuts and lots of spices. It combines sweet and salty flavours with a ton of cinnamon and sugar sprinkled on top. Due to a quite unusual combination of flavours M. didn't like it all that much. I thought it was quite delicious. Over breakfast we decided to stay in Agadir for two more days. We were both hoping M. would get better until we move on. We spent most of the remaining day on the beach. While I was exploring the beach, M. was relaxing in one of the available deck chairs. The sky was cloudy (a strange mist came rolling in from the ocean and didn't go away till the evening) for the most of the day so there was no fear of getting sunburned. 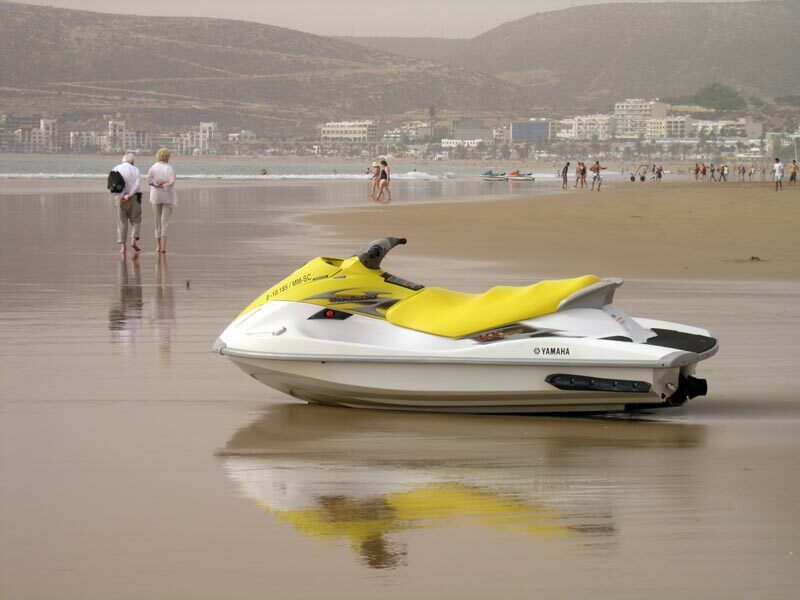 It is quite obvious that Agadir is often chosen as a vacation destination by wealthy Moroccans. Many of them work abroad, often in Spain or France. 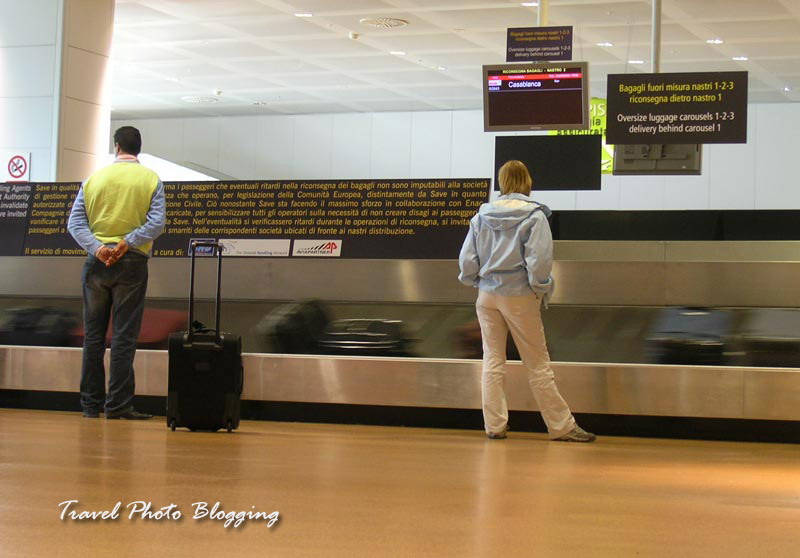 When they return for a vacation with their families, they usually have many Euros to spend. 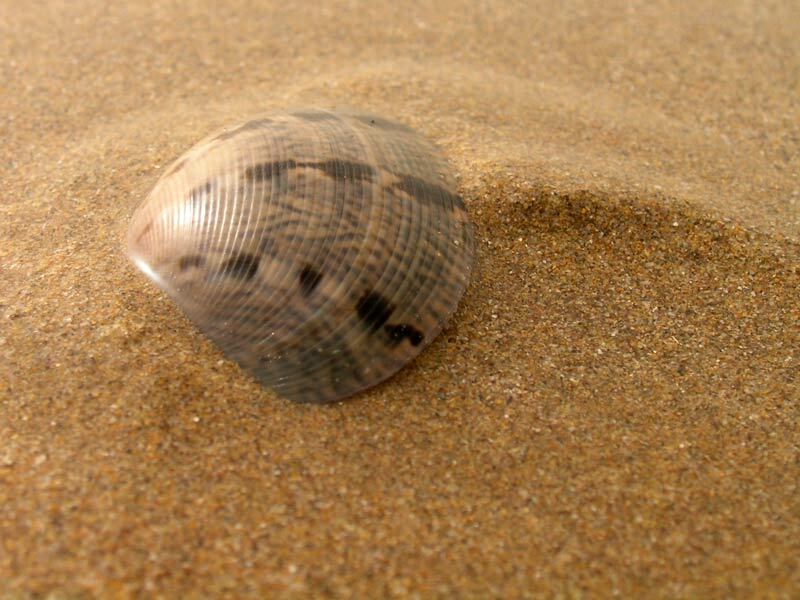 If you know these things it is not such a surprise when you see some brand new fast food restaurants by the beach. Western style! Pizza Hut and McDonald's neon sings can be seen from almost anywhere on the beach. Despite all that, one can still see some people in more traditional outfits. All in all it's a funny mix. While walking around the beach I talked to some locals. As I learned at some point of each conversation, every one of them tried to sell me something. This is just one of the reasons I don't like touristy places - it is usualy quite hard to make genuine contact with locals at such places. They just see you as a big fat bag of money (usually with a big hole, from which an endless supply of money is dropping). It took me almost a half an hour to explain to a guy that 40 Euros for a few minute spin on a water scooter is way over my budget. We finished our day at the beach with a walk to the fish stalls by the port. We knew the procedure from the day before. This time we opted for some shrimps and a red snapper. Everything came with a spicy sauce of some kind but we liked it anyway. On the way back to our hotel, we stopped for a fresh orange juice and mint tea. We weren't tired, but when we got to our room, we fell asleep easily.